Proclaiming Jesus Christ through Christian Visual Arts, Science and Communication Technologies: Past. Present. Future. APRIL 2019: 80 Years of Christian View-Master: the 3D stereo viewer that brought us Bible Stories, Birth of Jesus, Noah's Ark, and more. What Biblical creation information can we derive from the compiled data of the NASA Apollo 11 Lunar Laser Ranging Experiments? Exclusive: It is a piece of nineteenth century history, science and technology that could be right out of a spy novel. Biblical Genesis or Darwinian evolution? Hello. My name is Frank DeFreitas ... and my wife is Debi. Throughout history, many of the world's top artists, scientists and technicians have proclaimed Jesus Christ through their God-given talents. In short, our private family collection and outreach ministry documents how the Word of God gets to us ... through art, science and communication technologies: past, present and future. We offer a visiting program that includes a PowerPoint presentation with a lecture and discussion. Many of our exhibit items are either very rare or one of a kind, and should be seen by every man, woman and child this side of heaven! For over 35 years, my area of authority has been the Nobel prize winning fields of lasers and holography. It just makes good practical sense to obtain your information from the co-author of the world's best selling laser and holography book. Nobel Prize-winning field is bringing the Gospel of Jesus Christ into the 21st century and beyond. Unlike other 3D stereographic technologies that have preceded it, holography provides true 3-dimensional SPATIAL imaging. In other words, the recorded object has true three dimensions in space, not just a visual representation of 3D from 2D sources. See and learn about several examples of this technology being applied to the famous Shroud of Turin. UPDATE FOR 2019: Utilizing a newly obtained transmission and reflection densitometer system, I can now demonstrate LIVE and in REAL TIME the process of HOW the 3-dimensional information was extracted from the Shroud of Turin. Microscopic scripture was all the rage in the 1800's, and now it is being rediscovered once again in the 21st century through Wonders of the Bible. Imagine Biblical scripture and art so small it cannot be seen by the human eye. Tiny hand writing that must be read through a microscope! Famous museum Biblical paintings the size of a pin hole! 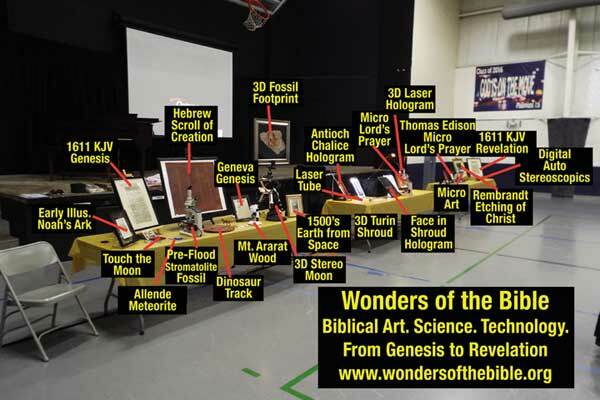 Scientists and technicians proclaim Jesus Christ through micro photography, laser holography, and nano technology. Absolutely the finest collection of its kind in the world today. Holography is a Nobel prize-winning field of physics that records 3-dimensional images using laser optical technology. This section showcases our work, including ancient Biblical archaeological artifacts, and other Christian based projects. Lasers record 3D holograms of various artifacts discovered on Mt. Ararat during a famous expedition to find the real Noah's Ark. Includes tooled petrified wood, pitched with resin, found at the summit -- and the story behind it. Pure ephemera, not adulterated by modern day expanded definition(s), deals with the throw-away printed items that pass through our everyday lives on a daily basis. Here are a few examples of the Wonders of the Bible Christian ephemera collection. An historically important archive of 19th century, Christian-based stereo photography. Many of these incredible records of America's Christian heritage are one of a kind, taken by independent photographers. One of the finest collections of its kind in the world today. Many images are also in the collection of the Smithsonian, Eastman Kodak House, Metropolitan Museum, and Library of Congress. Get to know the person behind Wonders of the Bible: Me (Frank DeFreitas). Here is a bio on my life's work with lasers and holography, my late-in-life salvation (2010), and the testimony of my faith. My loving (and patient) wife of 42 years led me to Christ, and I am eternally (literally) grateful. We would love to visit your church, school or home school group. No group is too large or too small. We have been at both large museums and small gatherings in homes. We serve all of eastern PA (Philly, Lehigh Valley, Lancaster, Reading, Harrisburg, Wilkes-Barre and Scranton), New Jersey (north and south), New York City (and all surrounding boroughs and counties), Delaware, Maryland and DC. 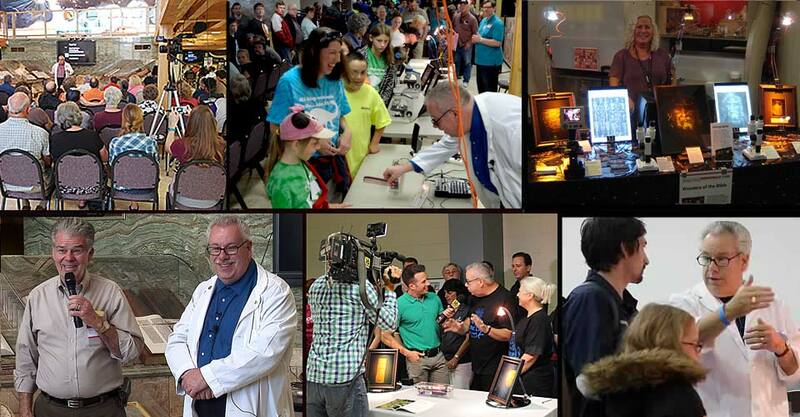 Some of our recent events include: Eastern Christian Conference, Hershey, Pennsylvania; The Institute for Scientific and Biblical Research, Lancaster, Pennsylvania; The New York Hall of Science, New York City, New York; The Creation Evidence Museum, Glen Rose, Texas; The Smithsonian, Washington, D.C.; Creation Celebration Conference 2017 and 2018, Newark, Delaware; Scientific and Biblical Creationist Fellowship, Newark, Delaware; Ephrata Mennonite School, Ephrata, Pennsylvania; New York Microscopical Society, Clinton, New Jersey ... and more. We would love to visit with you! We stand firmly on Biblical creationism, inerrancy, perspicuity and authority. θεόπνευστος (theopneustos): "God-breathed."